Eric Brotherton is a former Army helicopter pilot who needed to build more helicopter time to qualify for flying medevac helicopters. I told him that the Rotorway was a great time builder so Eric purchased a paritally completed Exec 90 and started over with it. Eric is always flying around the neighborhood and somehow even gets away with landing it in the park next to his home in town and hover taxiing it into his back yard. Eric hired Orv to provide his transition training and now flies his Rotorway Exec 90 on a regular basis. 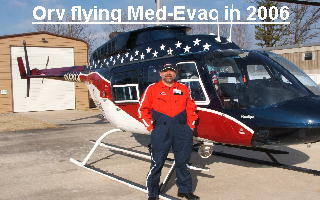 Eric is also the head mechanic for the Air Evac Life Team fleet of training Bell 206Ls. This shot is of Eric and Orv following Eric's biannual flight review at the Sho-Me Helicopters, LLC training center. In this close up you can see Orv resting his wrist on the inspection door that Eric put into the side of the helicopter. The entire side comes off as one unit so Eric used an aircraft cowel hinge to swing his acess door on. It really works slick.